July 14, 2009 was an important day for our18 month old daughter Alexandra. We were to receive the results of a brain MRI that we hoped would explain Alex’s developmental delays and would allay some of our fears about all the possibilities of what could be wrong. Instead, we received the devastating news that Alex had “a progressive brain disease and there is nothing that can be done”. We left Seattle Children’s Hospital that day in deep despair that Alexandra did not have long to live. We were referred to Dr. Russ Saneto at Children’s who diagnosed Alexandra with a mitochondrial disease, Leigh’s Syndrome Complex IV. The MRI revealed how the Leigh’s Syndrome destroys the basil ganglia area of her brain while her muscle biopsy showed that her mitochondrial function was less than 22% of normal. Dr. Saneto put Alex on a “vitamin cocktail” intended to give her the best level of functionality possible. After 2 ½ years of the vitamin cocktail Alex started to decline. It became difficult to keep her hydrated, she lost weight and motor function skills she had painstakingly gained, and she had a hard time recovering from common illnesses. These difficulties brought on a GI-tube placement for her. The difficulties allowed Alex to meet the criteria for an end of life drug study using the experimental drug, EPI-743. Alex was accepted into the study and her quality of life has since improved significantly. Alex has been on the drug now for 4 1/2 years. Gradually and through the amazing care and treatment by Dr. Saneto and Seattle Children’s Hospital, we have seen great changes for Alex. Once a puddle in our laps, she is now engaged and interactive with people and her overall understanding of things has improved. She is using more words and has developed a wonderful sense of humor that is revealed in her laughter and her efforts to tease. She has become a little person and wants to be like her sisters. Alexandra’s involvement and incredible results from the drug study have given us new hope for her and her quality of life. We know it is not a cure but we have had to add some new “To Do’s” to her bucket list! But, a simple illness is still Alex’s worst enemy, causing her disease to progress quickly. Whenever she starts a fever, we worry that this will be the one that takes her life. Alex also underwent reconstructive hip surgery to correct hip dysplasia, something we never would have considered before we saw her improvement from the EPI-743 study. Between the drug’s effects to reduce stressors and Dr. Phil Morgan’s incredible talent as her anesthesiologist, Alex stayed out of the ICU and recovered amazingly well. Since then, Alexandra wants to move and be more active. Our outlook for Alex is very different from that July day in 2009. 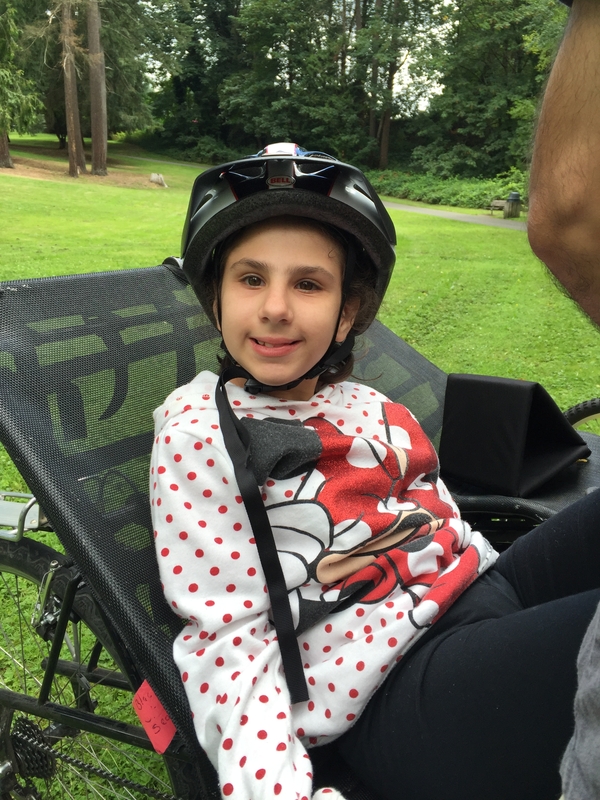 The extraordinary people at Seattle Children’s Hospital and your generous donations to this Mitochondrial Guild Auction have directly impacted Alexandra’s quality of life. Your donations have provided support for the EPI-743 study, support for a nurse practitioner for Dr. Santo, and grants and equipment for amazing research at the Research Institute. Alex has been blessed with amazing care and assured of a brighter future. Thank you all!